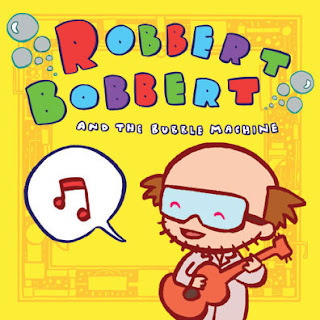 Robert Schneider, the mad scientist behind the beloved Apples in Stereo, has released an amazing new record for kids under his cartoon alter ego: Robbert Bobbert. It's just good science, kids. Like the Apples in Stereo records, this one is jam-packed with hooks, harmony, and kaleidoscopic sound design. There are songs about clocks, physics, superheroes and a bunch of animals. Oh, and there is a mouse who raps which is reason enough to own this record. Awesome fun. Robbert Bobbert and his Bubble Machine rocked Brooklyn's Bell House this weekend. Robbert brought the high-energy song and dance as well as some exceedingly curious (and hilarious) science. Bubble Machine brought the bubbles. The kids had a total blast and so did the parents. Check out photos below. Thanks for great show, Dr. Bobbert!